Somalis Grasp For Answers After 'Deadliest Single Attack Somalia Has Ever Faced' : The Two-Way More than 300 people died in a truck bombing that rocked the country's capital on Saturday — and it's likely that staggering death toll will rise further. Amid the rubble, difficult questions remain. Somali soldiers and rescue workers on Sunday inspect the scene of the truck bomb explosion in Mogadishu. The initial numbers were staggering — and they grew ever more devastating as rescue workers sifted through debris: More than 300 people dead. At least 300 people injured. A blast area the size of "two or three football fields," as one witness told The Guardian. The truck bombing in Mogadishu on Saturday — which tore through one of the Somali capital's busiest intersections, at one of its busiest hours — has left the country shaken and a section of the city in ruins. 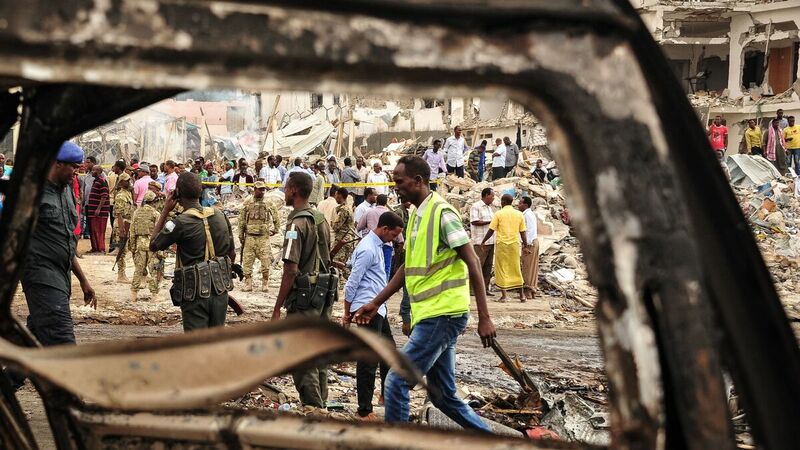 Even in a country that's no stranger to militant attacks, Saturday's violence marked "the deadliest single attack Somalia has ever faced," according to its Ministry of Humanitarian Affairs and Disaster Management. And even as the country moved to mourn its dead Monday — with more than 100 funerals held already — authorities expect the death toll to rise still further, as The Associated Press reports that scores of people remain missing. Given the intensity of the explosion, it's feared that some of the dead may never be found or identified. "My last time to speak with my brother was some minutes before the blast occurred," one woman told Reuters. "I am afraid he was among the unrecognized charred bodies that were buried yesterday. I have no hope of getting him alive or dead. But I cannot go home." "I have seen lots of people dying and crying," Abdulkadir Adam, founder of the city's Aamin Ambulance service, told NPR's Eyder Peralta. "Everywhere there are parts of the body, collapse of the house, burning of the cars. It was kind of traumatizing, mentally and physically and morally." Adam, who has 10 years' experience in the service, said he had never seen anything like this. It's a sentiment echoed by one man, who told the AP that he lost several family members in the violence: "With a heavy heart I would say this is the worst attack I have ever witnessed." The Somali government has blamed the killing on al-Shabab, an Islamist extremist group that has carried out a number of similar attacks in the region in recent years — including a 2015 assault on a university campus in neighboring Kenya that claimed nearly 150 victims. Just months ago, the group's hours-long siege of a Mogadishu restaurant left at least 31 people dead. Al-Shabab's transnational footprint and long-running antagonism appear to give it the means and the motive to execute an attack on the scale of what happened in Mogadishu -- which The Guardian reports involved "several hundred kilograms of military-grade and homemade explosives." Yet the militant group, which is rarely shy about claiming attacks, has not claimed responsibility for this one. Sheikh Mukhtar Robow, a former leader of the group who is now in Somali custody, condemned the bombing Saturday as an "irreligious" and "heartless" act, according to the AP. The SITE Intelligence Group, which tracks extremist organizations, notes that on social media Monday, the group claimed at least two dozen attacks from the past two weeks — pointedly leaving Saturday's attack unmentioned. Mohammed Haji Ingiriis, a student in Mogadishu at the time of the attack, told Eyder that while authorities are likely correct, it remains possible that another group — one of many that depend on an unstable government for profit — could have had a hand in this. "One of the interesting things we've seen is protests Somalis took to the streets [Sunday] to condemn the carnage. Analysts I've spoken to say maybe the scale of this will turn Somalis entirely against al-Shabab. They say maybe this can be a turning point for a country that has just been mired in conflict for decades." "Today, I lost my son who was dear to me. The oppressors have taken his life away from him. I hate them. May Allah give patience to all families who lost their loved ones in that tragic blast," one grieving mother told The Guardian. "And I pray that one day Allah will bring his justice to the perpetrators of that evil act."